Okay, I have to admit I buy the bulk of my books online. Not only do I find what I am looking for but I also don’t have to deal with disapproving glances from hipper-than-thou clerks who can barely restrain themselves from sighing as they see if they can order David Icke from the distributor. There are locally-owned book stores in Austin, Texas, but I’ve come to dislike BookPeople because they harass me to check my purse every time I go in (I could be naked and carrying a change purse and I’d be asked to check all my belongings at the front desk). Ever since FringeWare died a decade ago, I haven’t had a local store that I really like, a place where I can get my odd topics on without being subject to snerts for displaying a lack of intellectual snobbery or apparently being such a crime risk I have to leave my wallet, check book and car keys with a stranger in order to have the privilege of shopping. So when Mr. Oddbooks discovered that Brave New Books has been operating in Austin for 4 years, I was annoyed that I had not heard of them, but I am also a hermit so it comes as little surprise. Dubious, I agreed to check the place out and am glad I did. In fact, I was so pleased that I may start trying to visit other small book stores around Texas and beyond. Or I may not. I’m a notorious flake. But you never know. Brave New Books stocks titles that would appeal to those of us with interests in the fringe, lunatic or otherwise, as well as maintaining a nice little DVD section. The store also runs films in a back room, and hosts discussions on relatively diverse topics. On Saturday, July 24, there will be a discussion about the Templars and Christopher Columbus. Leaving my home two weekends in a row seems arduous to me because the only thing I hate worse than leaving my house is leaving my house, but I may well try to attend. I asked the owner, Harlan Dietrich, to tell me what book in the store he felt I needed to read. Because he is not the indiscriminate conspiracy nut that I am, he recommended The Creature from Jekyll Island: A Second Look at the Federal Reserve by G. Edward Griffin. I had heard some buzz around this book but am sometimes mentally lazy, preferring to read easier, more salacious sorts of books (evidenced by the ones I selected on my own and by the bulk of what I review here) and likely would not have purchased it had he not recommended it. And, best of all, the last copy of 9-11 Descent into Tyranny: The New World Order’s Dark Plans to Turn Earth into a Prison Planet by local hero, Alex Jones, whom I sometimes mock, but love nonetheless. And though I am linking to my Amazon account via some of the above links, I only do so when the book I purchased there is not on Brave New Books’ online ordering system or if I know I got the last copy and linking to it could cause the store some hassle. So you can shop there even if you don’t live in Austin – browse the site’s selection as well as their events section. It appears that this store, unlike some of the other independent book stores in town, is contributing to the community with free lectures and a space to watch films. Though I am laughably the worst person to be encouraging community involvement since my own community mainly involves simply the two levels in my own home, I think such engagement is to be lauded and supported. There was a lively political discussion taking place around the front desk while we were there, and the whole vibe of the place just suited me. I encourage you to shop there. Posted on July 23, 2010 August 20, 2015 by anitadaltonin PlacesTagged: austin, austin texas, book stores, brave new books, Harlan Detrich, I Read Odd Books, Independent Books Store - Hell Yeah! So would you say this store has an ironic or sincere relationship to its wares? Or does that question even make sense anymore? No, this question makes sense. Believe me, I know the distinction you are trying to make. Is the store inhabited by hipsters who sneer at off-center belief systems and mock those who spend their hard-earned, rube dollars in their establishment, or is it a place wherein all kinds of information is being sold with respect and without snark? I did not get a sense of irony when I was there. I did not sense anything was stocked with sarcasm. The owner had a smattering of information about whacked-out theories though he did not necessarily embrace such ideas. He seemed amused by a couple of my purchases, especially the Liquid Conspiracy book, but he was not amused by me – just the outlandishness and garishness of the book itself. I did not feel patronized when I purchased my books. It is the sort of store where everyone congregates around the cash wrap and as the owner rung me up, a couple of the regulars in the place recommended titles in similar veins and smaller conversations were sparked about the Federal Reserve and government use of LSD. All in all, the place was pretty earnest. Brave New Books is a little known treasure in Austin. I’d encourage everyone to check out the store. I found this store a few years ago and Harlan is fabulous to work with setting up events and lectures. It’s places like BNB (as the regulars call it) that help Keep Austin Weird. I like to encourage this sort of genuine “Keep Texas Weird” myself. I really need to get over my hermetical nature and go to some of the lectures at BNB. Thanks for sharing, Nancy. I also noticed you link to a nascent site – once you have it going, drop me a line. I’d be interested in reading it. Brave New Books is an awesome bookstore. Creature from Jekyll was the second book I got there. First was End The Fed. Both great books. I am admittedly a person who prefers a sensationalist wallow as opposed to a serious look at what has become of the American financial system, but I will have read The Creature from Jekyll Island before this year is over. I’ll have to look into End the Fed, as well! Thanks for your comment. 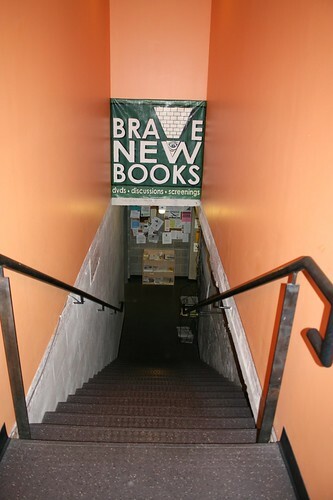 Brave New Books is THE authentic Austin intellectual underground. Brave New Books is hands down my favorite bookstore/hangout spot in Austin – and really, in any Texas city. There are many television screens, couches, chairs and tables. You can go to read, watch, listen and discuss. The events are great, and Harlan (the owner) generously allows various groups to host meetings on a weekly, bi-weekly, or monthly basis (probably for a small fee), so there is frequently some kind of truth-loving action going on. I live BNB, and hope to see it continue its career as an Austin landmark and truth movement HQ for years to come. When I was there, there was a lively discussion around the cash wrap and a film was showing in the back room and one man was back there, absorbed with the content. 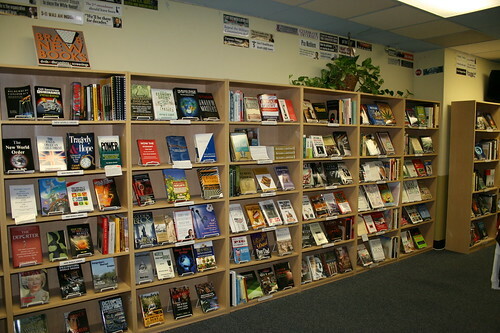 That that in and of itself showed a level of involvement with the community that one doesn’t see in other places, even independent book stores. I am very heartened to see others have strong feels about the place. I plan to go back soon and blow my book wad (yuck at that metaphor, sorry). I really liked the store and its whole vibe. I just read this comment thread from 2010. 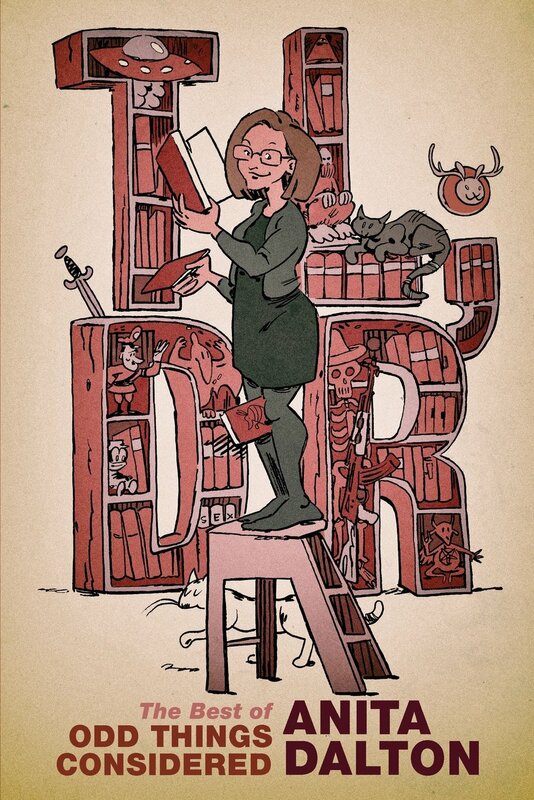 I am curious … What are your thoughts regarding Griffin’s book? I think that is one of the most important books one can read. Ned, I feel like such a jerk because I haven’t read it yet. I have about ten years of books to catch up on. However, when someone says a book is one of he most important books a person can read, that carries some weight with me. I’ll try to read this soon and tell you what I think and/or discuss it in this site.